From left, during the Thursday, June 25, American Legion Post 457 Community Service Awards Ceremony, are Post 457 member Dan Shaw, Don Lettie, Post 457 Commander Roy Terry, and Paul Johnson, owner of Indco Electric. Lettie was the recipient of he 2015 Individual Community Service Award while Indco Electric received the 2015 Business Community Service Award. 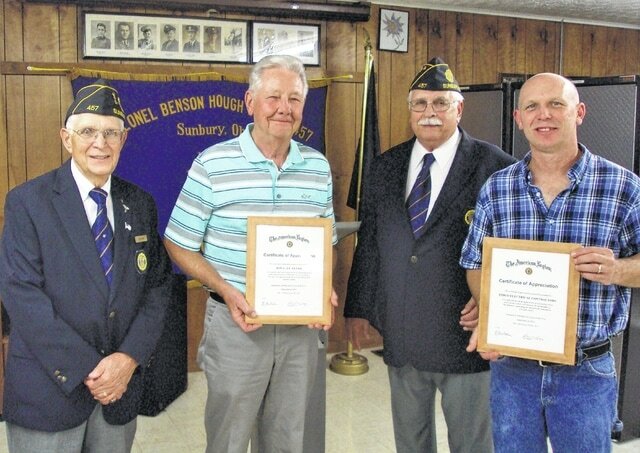 Members of Sunbury’s Col. Benson W. Hough American Legion Post 457 awarded the post’s annual Community Service Awards during a dinner meeting on Thursday, June 25. Each year for the past four years an individual and a business in the local community have been selected by Post 457 members to receive recognition for going above and beyond the normal expectations of service to their community. The 2015 recipient for individual recognition is Galena resident Don Lettie. Terry said Lettie works with Big Walnut Friends Who Share, the local, grass-roots social service agency and food bank; and is also very active in the Sunbury UMC and operates their video equipment as well as many other church activities. The business recipient of the 2014 Post 457 Community Service Award is Indco Electrical Contractors, Inc., of Sunbury. Indco Electrical has 14 employees and is recognized as a leader in the industrial electrical field. Some of Indco’s past projects are assembly lines, weld centers, clean rooms, robotic automation and material handling. They are also in the tele-data field installing fiber optics, cat 6, cat 5, CCTV, security and IP camera systems. For additional information about Col. Benson W. Hough American Legion Post 457 go to < americanlegionsunbury.com >.